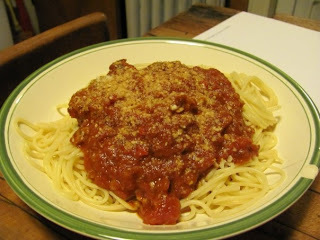 Fittingly, the first post on Sauce (The Food Blog)--and hopefully the only post on the subject--is a recipe for a basic spicy tomato sauce to pour over your pasta. I don't actually much like pasta, or tomato based sauces, for that matter, but I have to admit they make a convenient meal. Plus, the sauce can be made in batches and stored in glass jars of plastic bowls with tight lids (which is what I do). Given half a chance, though, I'd make myself some good Indian-Chinese style chowmein with the killing ajinamoto seasoning. Yum yum! Pasta, alas, makes bloody awful chowmein substitute. 1. A jar of tomato-basil or tomato-garlic ready-to-eat pasta sauce OR a tin of peeled preserved tomatoes OR about ten medium-sized thoroughly washed and cleaned dishi tomatoes. 2. Peeled and crushed garlic, as many as you like (I like at least ten Indian or six American cloves). 3. Chillie flakes OR chopped dry red chillies (shukno lonka). 4. Salt, sugar, ground pepper. 5. 2 large onions, peeled and roughly (if you want your sauce to be chunky) or finely (if you don't) chopped. If in America, please use just one large red onion. It will be quite enough. 6. Vegetable or canola/rapeseed or sunflower oil. I'm sure most people would prefer olive, however, this is a blog for the financially challenged. 1. Oregano and fresh basil (tulshi leaves). 2. Meatballs/boneless pieces of meat/sausages. 1. If using tinned or whole tomatoes, chop them into little pieces. The better chopped, the more easily they will integrate. But if completely minced, they won't have time to acquire the fried flavour before disintegtrating into a semi-solid mass. 2. Heat oil in a spacious saucepan or wok. Add the onions and stir fry till they turn transparent and begin to smell (of lightly fried onions). Add the crushed garlic--and even if you have a garlic crusher, I prefer adding the actual garlic as well as the juice--and keep frying over a low-medium flame. It should be smelling quite delicious in about a minute or so. The onions should also be turning caramel brown. 3. If using whole or tinned tomatoes, add them now, turn up the heat to medium, and continue to fry. If adding ready-made sauce only, wait for the onions and garlic to be better fried (about one more minute). 4. Once the tomatoes are well fried (they will have let most of their water out by now, so there should a shallow broth in the pan), add the chopped basil, stir fry for about twenty seconds, and then add water. If adding only sauce, pour the whole jar before adding water, and mix well with onions and garlic. 5. Add salt, sugar and pepper. Stir the pan gently but well, folding all ingredients in thoroughly. Turn the flame up to medium-high and cover the pan. Make sure you've added enough water to keep the pan from charring and leaving you with one hell of a wash-up. (Meat Intervention) if using meatballs or sausages, fry them well--and I mean well, no pink meat should be visible anywhere, then chope the sausages into as large or small pieces as you want (the meatballs will disintegrate by themselves in the sauce, no chopping required). If using pieces of meat, make sure they have been marinated in lemon juice and salt for at least an hour (I prefer three) before chopping them into tiny pieces and frying them well too. Drain all fried meat and keep aside (end meat intervention). 6. Check back after about fifteen minutes. The sauce will very likely still be watery and will need some more boiling BUT, this is the time when you liberally (or not so liberally) layer the top of the sauce with chillie flakes/chopped shukno lonka and then fold it in well. Adding shukno lonka later adds that special bite to the sauce. 7. Add fried and drained meat. Fold in well. Sprinkle oregano on top. Fold in well again. 8. Cover and let it cook on medium-low for as long as it takes. I prefer a lower flame because that softens the meat and mixes the flavour better, but you may not have the time. 9. In the meanwhile, bring water to a boil. Add pasta. Cook till however well done you like your pasta. Drain the pasta on a colandar, chaalni, drainer. Let it stay that way while the sauce is being cooked. Flip it occasionally with a fork to make sure it doesn't get soggy inside. 10. Serve with a sprinkling of grated parmesan on top. I'm thrilled. But more photos please, like your facebook ones. Like step by step ones. I'll add you on the list of food blogs on the right of my blog. Kaichu--yes.. Insert signature Terry Pratchett quote about five exclamation marks. TBJ--thank you very much :-) I just took a look at that blog and man, does she make an effort! My cooking is far more basic than that, and I often forget to take pictures because I'm either rushed or too hungry to care. But now that I have the blog I shall certainly make more of an effort.